My ultimate list of vegetarian restaurants in Tokyo! Actually, this is a list of vegetarian-friendly restaurants that also serve meat, which are a lot harder to find. As a vegetarian travelling with meat-eaters, I need restaurants that cater for both of us, which is difficult in Japan. I’ve found that 100% vegetarian or vegan restaurants are quite easy to find – there are already lots of lists of them, but it’s harder to find regular restaurants that also cater to vegetarians. In the UK it’s standard for most restaurants to have at least one vegetarian option (even if it’s something really boring, like vegetarian lasagne). In Japan, however, that’s not the case. Most restaurants have no vegetarian dishes at all. I can’t tell you how many times that we’ve walked the streets, tired and hungry, looking for somewhere to eat. So that’s why I wanted to share this list with you. While I love spontaneity, you’ll have a much less stressful time if you do some research and go to Japan armed with a list of places where you can eat, if only as a back-up. I’ve had far better meals and enjoyed Japanese food so much more when I’ve researched places to eat. I’ve also been able to enjoy authentic Japanese food, rather than falling back on pizza and pasta as a last resort because I can’t find anything else. Most dishes that look like they’re vegetarian actually contain dashi, which is fish stock. It’s a main ingredient of Japanese cooking, and will almost definitely be in any meal containing soup – that includes ramen and bowls of noodles with soup. While it’s possible to make vegetarian dashi with konbu (seaweed) and/or mushrooms, when you’re eating out, the default is almost always dashi made with katsuoboshi, which are fish flakes, and it’s pretty hard to avoid in Japan. I really hope this list helps you. It’s correct to the best of my knowledge, but please do your own research about each place and if you come across anywhere that’s not open any more or that’s changed their menu, please do let me know. Non-Japanese food – When you go to Japan, you want to eat Japanese food, right? It’s really frustrating when I ask for recommendations and receive links to pasta and curry places – they might be great but I can have them any time! I want to try authentic Japanese food in Japan! So this is a list of restaurants with Japanese food. On the whole, I haven’t included other types of restaurants. If you get stuck, they usually have margarita pizza, tomato pasta or vegetable curry. They’re a good back-up if you can’t find anywhere else, but I haven’t included them here. 100% vegetarian/vegan restaurants – This list is for vegetarians and meat-eaters travelling together. I travel with meat-eaters and wanted places we could all enjoy. There are just one or two included that I couldn’t resist, and I’ve mentioned which these are. If you want fully vegetarian or vegan restaurants, Happy Cow is an excellent resource. 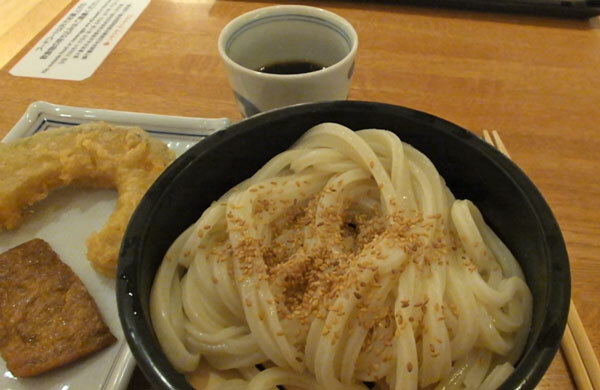 Udon are thick, white noodles – often served in a soup made of dashi, and accompanied with tempura. Tempura sets often include vegetables – if you have to, you can order a set and avoid the fish, or choose pieces individually. Another option is zaru udon, which is cold udon served on a bamboo tray. Leave the dipping sauce (it contains dashi); have soy sauce instead and any other table sauces, pickles or sesame seeds. You can also get zaru soba, which is the same thing but with buckwheat soba noodles instead – it’s actually really refreshing. I had zaru udon at the Soramachi food court at the SkyTree – you can see it at 4:28 in this video – at the time I wasn’t very impressed but if you stock up on condiments and tempura it makes it into more of a meal. 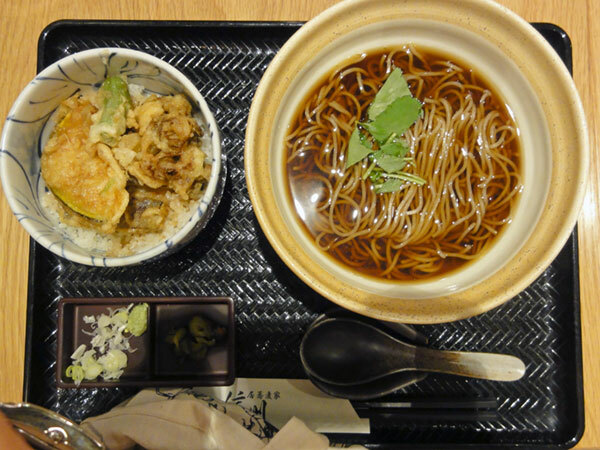 I prefer zaru soba (which you can see in this video from Shibamata) because the noodles have more flavour. An udon/tempura chain with lots of branches. Look for the orange sign. Avoid any dishes with soup. The oroshi shoyu udon is vegetarian, with grated radish and soy sauce. There are some vegetable tempura items, plus sides like inari nigiri (tofu sushi), bowls of plain rice and boiled eggs. Another chain with lots of branches. There’s a vegetable tempura bowl on the menu. Fast food curry chain. Good for a large, cheap meal – I love going there for a late breakfast! The best thing about Coco Curry is you can customise your curry by choosing the spice level and adding toppings. The rice is delicious and perfectly cooked too. 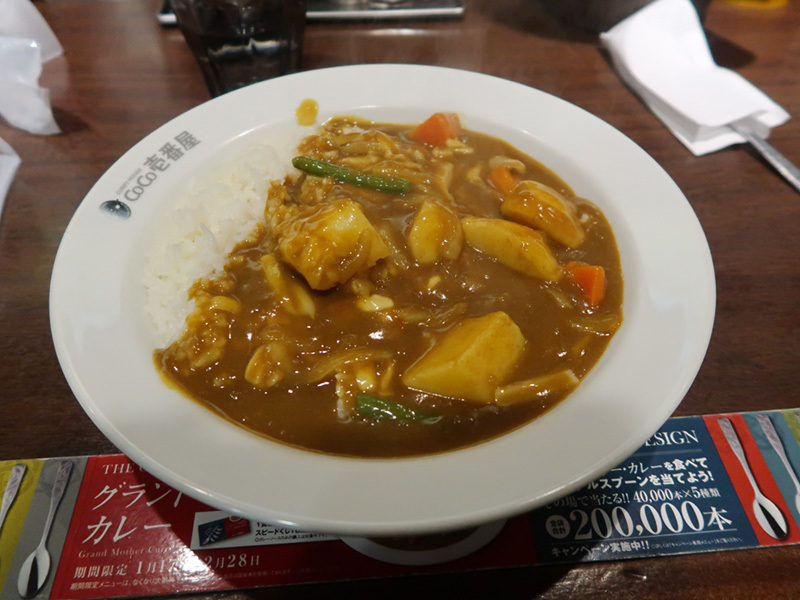 The regular curry contains meat (even the dishes that look vegetarian). There’s a separate vegetarian curry sauce, which is only available at some branches (details below). Sometimes the vegetarian curry’s on the standard menu, and sometimes there’s a separate vegetarian menu (you may need to ask for it). Okonomiyaki is sometimes called a Japanese pancake or pizza – but it’s not really that much like either, apart from being round and flat! It’s made of shredded cabbage with batter and toppings, with delicious dark sauce and mayonnaise. (Much better than it sounds!). Okonomiyaki is one of my favourite Japanese dishes – I can never understand why it’s not more well-known over here, because the flavours definitely appeal to a western palate. If there isn’t a vegetarian option on the menu, most restaurants can make one if you ask nicely. I’d recommend anything with cheese! In the worst case, at restaurants where you make your own at the table you can choose which ingredients to pick out and which to include. Leave off the katsuoboshi (fish flakes). Okonomiyaki restaurant on the restaurant floor of MyLord dept store (love that name!) in Shinjuku, right by the station. Last time I went there was cheese and mochi monjayaki on menu, and they made an okonomiyaki version when I asked for it. 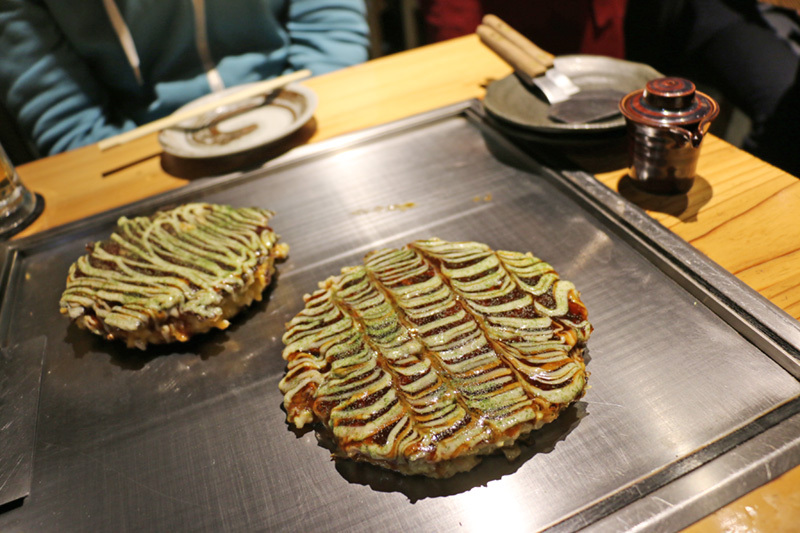 (Monjayaki is a runnier version of okonomiyaki that you eat from the grill with a kind of spatula). 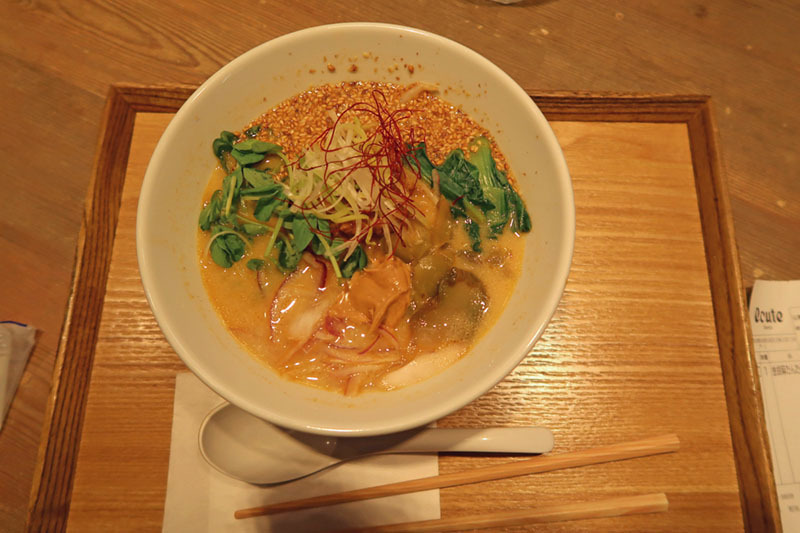 Unless you’re at a vegetarian restaurant, ramen is guaranteed to contain fish or meat stock, even if the toppings look vegetarian. That’s why these places are so special! Branches in Harajuku, Ginza, Akihabara and Asakusa – but it doesn’t feel like a chain. Small, cosy ramen place with a vegetarian option that includes fake chashu pork. To me this tasted like an authentic, traditional Japanese ramen. Really friendly and cosy atmosphere, with quirky decor. I went to the Ginza branch, which is in a backstreet near all the big designer shops – completely incongruous with a quirky little ramen place! Vegan restaurant in Shimokitazawa. Also serves curry. Small chain of ramen restaurants with a vegetarian/vegan ramen option and gyoza. 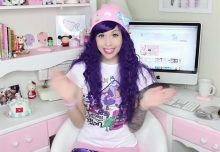 Originally I made a video about the Akihabara branch, then it closed down, boo! The good news is, there’s another branch in Tokyo, in Shimokitazawa, which is an area with lots of indie shops and gig venues. 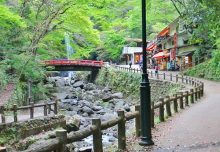 There are also branches in other areas of Japan, including Osaka and Kyoto (details in my blog post). For a while they stopped doing the veggie ramen but now it’s back, with a slightly different version from the original, which is in my new video below. The chef who created the dishes has a Michelin star. It’s cheap and you order from a vending machine, which is always fun. Not really a museum in the traditional sense, but a collection of ramen restaurants. They serve half portions as well as full bowls, so you can try ramen from different regions of Japan. However the half portions are still pretty big! Several of them serve vegetarian ramen (clearly indicated), and they have English menus. You order from a vending machine. 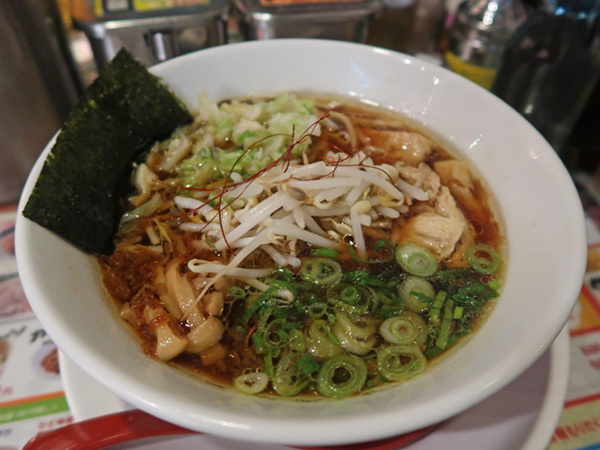 Lots of fun and great ramen – just make sure you’re hungry so you can take advantage of trying different types! There’s an Okinawan bar in the middle – one of the few places where you can get Orion, an Okinawan beer. This is outside Tokyo in Yokohama but worth the trip if you’re a ramen fan! Combine it with the Cup Noodles Museum for a noodle-themed day! My number 1 favourite ramen in the world! Completely vegan restaurant with a selection of types of ramen, plus some other dishes and sides. The menu varies slightly by location. Very well known and recommended by lots of people. My fav is the Golden Sesame Ramen – every time I want everything on the menu. They do sets with a ramen of your choice plus gyoza or kara age (fried chicken in soy and ginger sauce). Allergens are clearly labelled. Ueno Station – In Ecute shopping centre, inside the ticket barriers. More dishes on the menu than Tokyo Station. Tokyo Station – Located on Keio Street, inside the ticket barriers. Sendai – The only branch outside the Tokyo area. In S-Pal shopping centre in the station, on the basement restaurant floor. Jiyugaoka – Not as ramen-focussed as the other branches. Hirakawacho (near Hanzomon and Kojimachi subway stations). Like traditional ramen shops, it closes when the soup runs out! Check the opening hours on the website. I went to the one in Tokyo Station, which can be tricky to find as Tokyo Station’s HUGE. Look for a blue sign with a round logo and the mural of Mount Fuji. 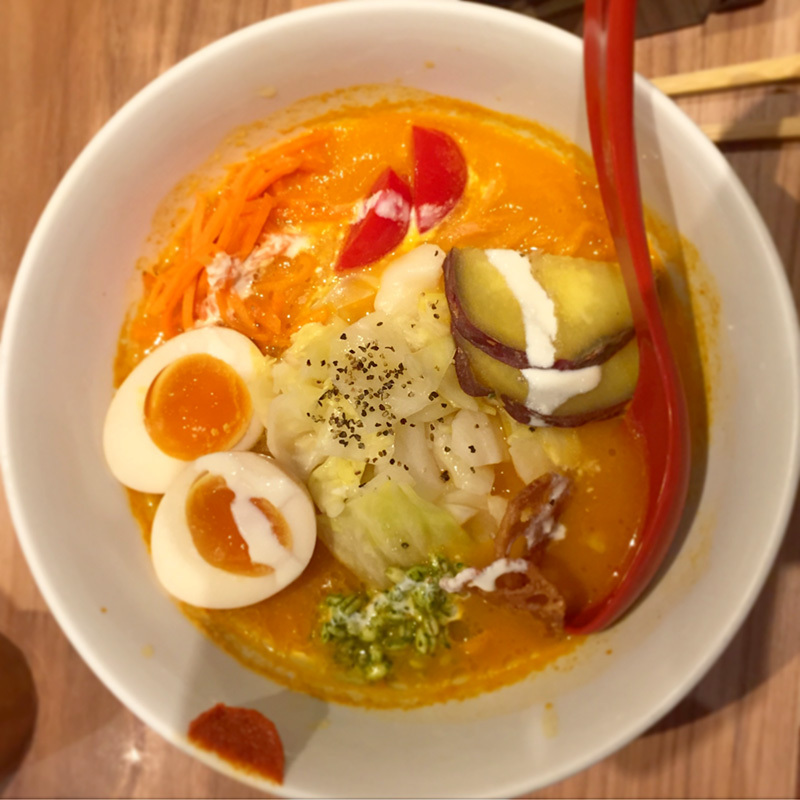 The ramen is very non-traditional – the soup’s made of pureed carrots! There are several variations and two of them are vegan. 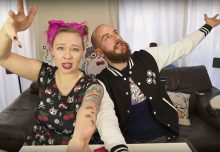 – Several more in this blog post on Ramen Beast. Fun conveyor belt sushi place in Shibuya where you order on a touchscreen! Popular with foreigners, so you might have to wait for a seat. Our favourite out of the cheap sushi places we’ve been to, and lots of fun. For vegetarians there’s kappamaki (cucumber), sweetcorn-mayo, natto, kanpyo, inari nigiri and several others. It’s also cheap so you can have lots (and we do!). Sister branch of Genki Sushi, with an identical menu. It’s basically the same, but with slightly more seating so you might have a shorter wait. It’s also in Shibuya. A typical cheap conveyor belt sushi bar in Shinjuku. There’s an English menu and several veggie options. The name means “sunflower”. Cheap conveyor belt sushi with veggie options including avocado (unusual in Japan – it’s not traditionally a sushi ingredient, it was introduced in the west as an alternative to fatty tuna). There are branches in Shibuya (Seibu department store, 8th floor) and Ikebukuro (Seibu department store, 8th floor). 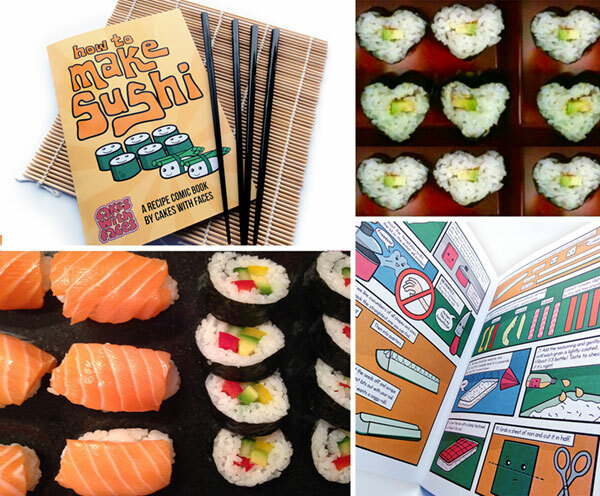 Take a look at my How to Make Sushi comic! You can learn to make delicious sushi at home (fish and veggie), along with edamame and gyoza. It’s so much fresher than shop-bought sushi and you can make it just how you want it. The comic comes as a gift set with a rolling mat and two pairs of chopsticks. 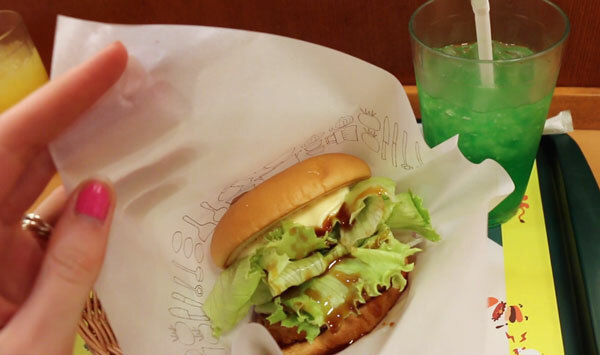 I love the teriyaki burger – often teriyaki sauce is for chicken so I haven’t had it very often. 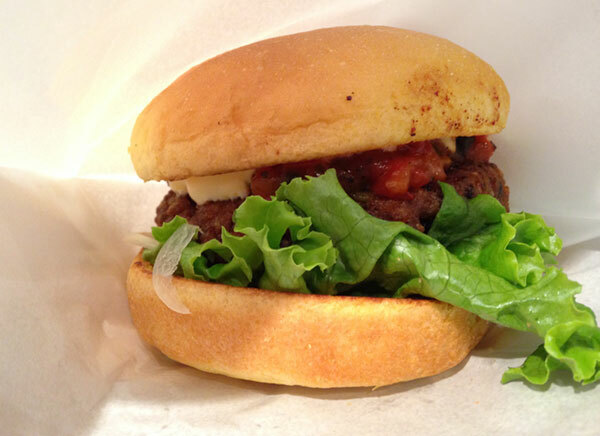 It’s also a novelty to have a choice, and a veggie burger that’s not just a generic “burger”. They serve meals in baskets and have my favourite: melon soda, as well as good, thick milkshakes. You can see it at 3:13 in this video from Akihabara. Warning: On the allergy information it suggests that the soy patties may contain chicken. The allergy info on the Mos website is inconsistent and confusing – for some of the soy burgers it says they’re only made on the same production line as chicken (regular soy burger and cheeseburger), and for others it says they contain chicken, pork and beef – so it could possibly be the toppings that contain meat products. Now I don’t know why a soy patty would be made with chicken, and to me it doesn’t taste or look like it contains chicken. I assume it’s probably cooked in the same oil as meat products (which is probably the case in most restaurants) so that’s possibly what they’re referring to. That’s just my assumption – I’ll leave that info with you to make your own choice. I’ve also heard that the mixed vegetable kinpira (with the rice buns) is made using dashi, but I haven’t tried that one. Another Japanese fast food chain, which emphasises fresh food. There’s a veggie burger on the menu. I memorised the name and took a screenshot of what I wanted, which turned out to be completely unnecessary as the server spoke perfect English! Pricier than the other places I’ve mentioned. There are several Ain Soph restaurants – they’re all 100% vegan and each has a different menu. The one in Shinjuku is fast food, with burritos and burgers, etc. 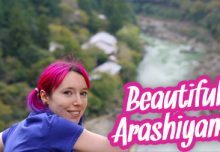 Sharla in Japan went there a lot in her videos. Shabu shabu involves a hot soup and cooking your own ingredients at your table. It usually involves meat and a meat or fish stock-based soup, but this place in Shibuya has two soups that are vegetarian: tomato and spinach (horensou). You can order a split pot and have two different soups. Yakitori place / bar where everything is 298 yen ,including the drinks (it’s gone up slightly since my video!). Really fun place, and a great place to spend the evening with friends. You order small plates of food to share. It’s mostly meat on sticks, but there are several veggie options, including potato salad (ask for it without the katsuoboshi fish flakes), “endless” cabbage salad, tomato, edamame and chips. The mochi cheese looks vegetarian but my friend thought it tasted like it’s cooked in meat stock. There’s a picture menu (or a touchscreen with English language option) so it’s easy to order. There are lots of branches – look for the yellow sign. Search on Google maps for “Torikizoku” to find them. I went to one in Shinjuku. A rare find! Gyoza usually contain mince. Very small gyoza place with only about 6 seats on 3 tables. It’s in Ikebukuro, on the west side of the station (look for the yellow sign). 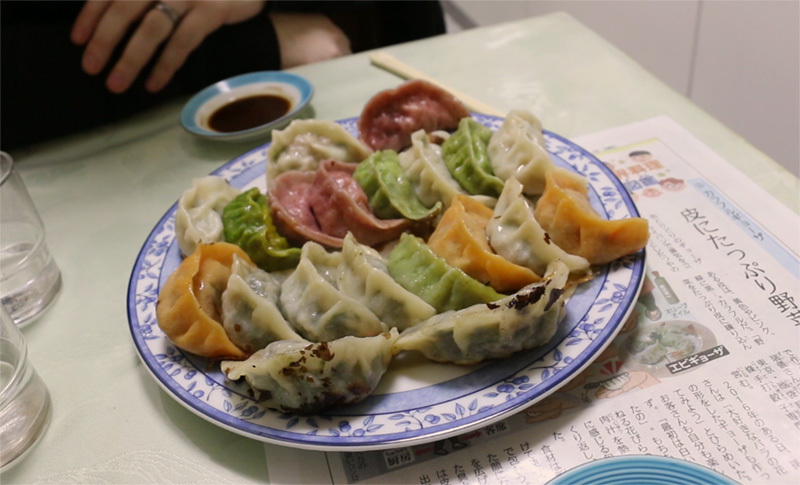 There’s a huge variety of handmade gyoza, with lots of unusual fillings. The owner is very friendly and understands what vegetarian/vegan means. She asked if it was my first time there, and prepared a plate of 10 gyoza of different varieties for me. Different from gyoza I’ve had before, delicious and cooked well. If it comes to the worst and you can’t find anywhere to eat, grab a snack from the convenience store. They’re everywhere, they’re cheap and the food is good quality. Some even have a few seats for eating in, and they usually have a microwave for heating dishes up for you. Onigiri (rice balls) – now have English on the labels as well as Japanese, so there’s no more “onigiri roulette” if you don’t read Japanese. Vegetarian fillings include konbu/seaweed and pickled plum. There’s a chance they may contain small amounts of dashi, but to me they don’t taste of fish. 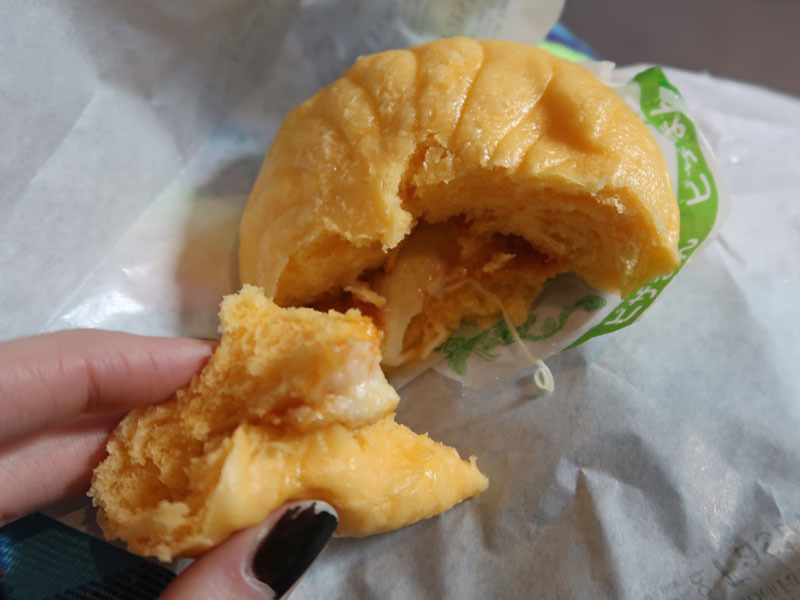 Pizzaman – Steamed bun in the hot food section on the counter, containing cheese and tomato sauce. There are also sweet red bean paste buns. 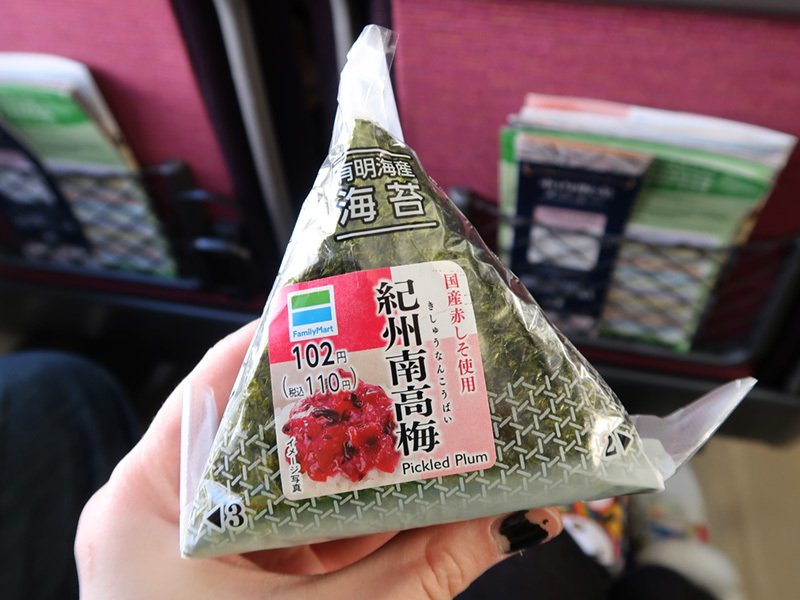 Pickled plum onigiri – very strong flavour, not for the faint-hearted! Cheap Japanese fast food chain, with branches all over Japan. 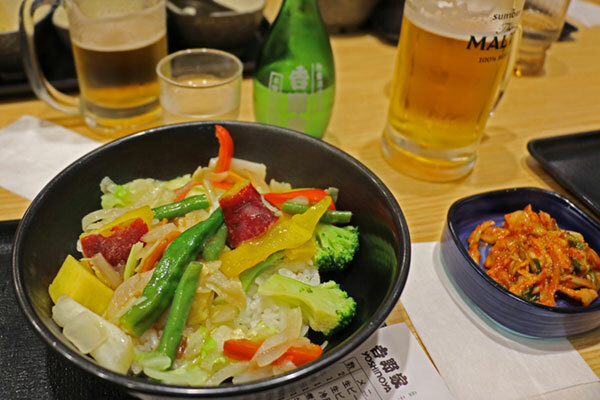 There’s one veggie option: a bowl of steamed vegetables on rice. If you add side orders of cheese, kimchi or egg and free pickles on the table, it’s actually a decent meal – and cheap. You can see it (and the menu) at the start of this video. Taco rice is an Okinawan dish of taco fillings served on rice. This place has a vegetarian option (rare) with avocado and beans. It’s in Kichijojo in Harmonica Yokocho, a collection of alleyways with lots of restaurants and bars to explore. Restaurant in Kichijoji with Japanese-style meals of rice, miso and sides. There are vegetable, fish and chicken set meals for around 1000 yen. Serves chanko nabe, which is what sumo wrestlers eat! It’s a hotpot with soup (in this case konbu-based) and vegetables. Near Suehirocho Station (Akihabara area). Slightly outside the central Tokyo area in Sengawa (near Chofu). In the evenings it’s a gig venue. There’s a meat and vegetarian menu. I’ve not been but have heard the veggie tonkotsu ramen is recommended. Check the opening times as it’s not open every day. Shojin ryori (completely vegetarian) counter in Akihabara. Set meals with rice, miso soup and lots of small dishes. Shojin ryori is buddhist monks cuisine, usually found at temples. 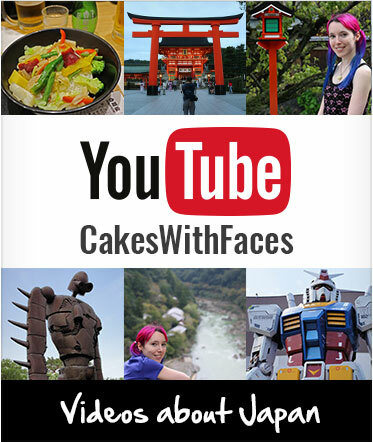 If you’re planning a trip to Japan, subscribe to Cakes with Faces on YouTube for new videos every Thursday: travel vlogs and tips for planning your trip.